The Hounslow Business Awards 2017 returned to the Hilton London Syon Park in October 2017, rewarding a selection of local companies and entrepreneurs for a variety of business achievements. 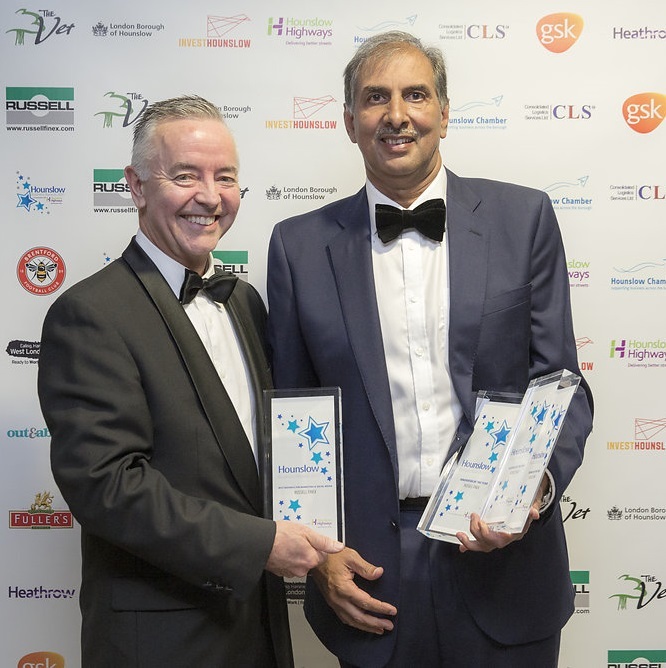 In its fifth year, the awards are organized by the Hounslow Chamber of Commerce in association with Hounslow Highways, and the ceremony is the highlight of the year for the business community of the London Borough of Hounslow. With 13 awards categories recognizing a diverse range of business areas and insight, the ceremony rewards a variety of companies of various size, in many market sectors. Russell Finex, a global leader in the manufacture of industrial processing equipment, was delighted to win three awards at this year’s ceremony. The company was named Innovator of the Year, Best Business for Marketing and Social Media, and took home the evening’s highest accolade – Business of the Year 2017. This success highlights another ground-breaking year for Russell Finex. The company’s growth has been built upon innovation - taking measured steps into the unknown, in order to continue developing a premium range of sieving and filtration equipment for the modern-day processing industry. 2017 has seen the development of Russell Finex’s most complex innovation to date - the Russell AMPro Sieve Station™ - the innovation behind Russell Finex being named Innovator of the Year. The Russell AMPro Sieve Station™ qualifies and requalifies powder within the 3D printing process. A future-proofed AM powder handling system supporting additive manufacturing through eliminating good powder wastage as the industry advances and forms a major part of the manufacturing landscape, this system safeguards operator safety and guarantees powder quality. Further investment into the company’s sales and marketing strategy was highlighted by Russell Finex also being named Best Business for Marketing and Social Media. The last twelve months have seen the opening of the company’s new subsidiary in China, and various marketing efforts have been implemented to ensure this new territory is targeted in a strategic and structured way, consistent with Russell Finex’s global brand. Other territories have also been actively targeted, with a new liaison office recently opened in Brazil, as well as further language websites launched, such as Thai and Hungarian, with more in the pipeline. Efforts have also increased through various corporate digital marketing and social media channels, including several improvements to the global website which has improved usability for customers on both mobile and desktop versions. These updates have paid dividends in increasing leads and driving further sales, as the company continues to grow. Winning ‘Business of the Year’ was the highlight of the evening for Russell Finex, marking the culmination of developments across all departments in the company. As well as new product development and increased sales and marketing efforts across the group, Russell Finex has also invested in significant improvement of its main manufacturing facility in Feltham in recent times. New manufacturing processes, automated equipment and a new efficient layout have been introduced, to ensure the company continues to meet the highest standards of quality in its products, as well as increased demand. The company has also continued to recognize the importance of CSR activity, reflected by various environmental improvements, as well as charity and community engagement projects. The introduction of solar panels, a wood-pellet burner and eco-friendly lighting and equipment throughout its facility has led to a significant reduction in the company’s carbon footprint. Russell Finex is committed to supporting various local, national and international good causes, and holds regular fundraising, awareness and donation events across its global subsidiaries. As well as charitable activity, the company is also aware of the importance of engaging with the community. This was highlighted in 2017 by the commissioning of a giant Mo Farah mural on its factory wall in Feltham, as way a of commemorating the local athlete and creating a new landmark in the town. Russell Finex would like to congratulate all other finalists and winners at the Hounslow Business Awards 2017. Find out more about the background of the company here.